Looks like it could be a little complicated, right? Nope, easy-peasy and fun too! Zailz by Spokane WA, CZT Loretta West is simple to draw “one stroke at a time™”. I like this tangle a lot. Similar in concept to CZT Sue Clark’s Tri-Po which has been around for quite a while, but a little different in execution, Zailz is Loretta’s first tangle pattern on the site. “This tangle was developed from two converging inspirations. In addition to being an Art Instructor and a CZT, I am also a sailor and am now working towards becoming a Skipper, so the shape of the tangle is derived from looking at sail shapes…. a lot. Secondly, I love to look at Japanese Woodblock Prints for inspiration, the way they are organized and designed is amazing to me. The Great Wave by Hokusai is one of my favorites and I thought of it frequently when working out this tangle which pretty much drew itself. I live in the Inland Empire of Eastern Washington State, not far from the Idaho border and only a couple of hours from Canada, where I was born and raised. Even though we live in a desert highland, there are numerous lakes for water sports close to Spokane where my home and studio is located and where I live as my Mom says ‘the life of Riley’, with my patient husband and Labrador. Turning your tile is definitely the secret to an interesting result with Zailz. 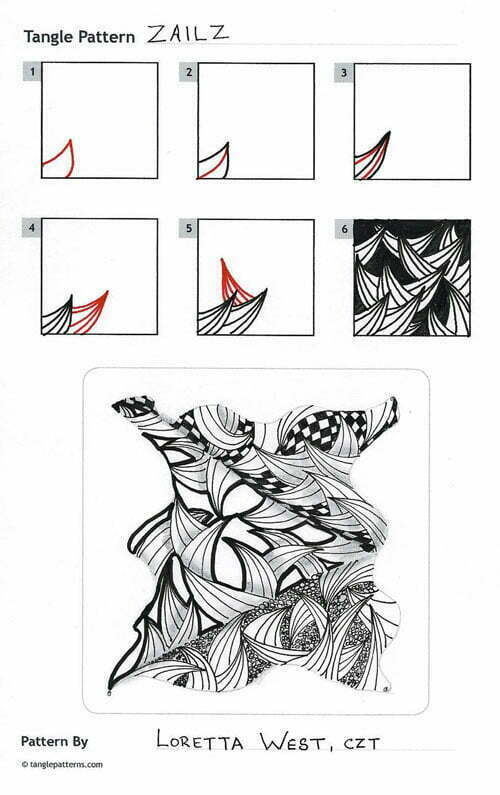 Loretta illustrates the step-by-step instructions for drawing Zailz below and shows it in a cool Zentangle where she uses orbs and the Zentangle-original tangles Knightsbridge and Amaze/Stiritup as “fillers”. I like it! Lots of energy in this. Thanks for sharing! Love this tangle. I also love Washington state–I spent some time in Colville, Washington and loved every minute. It is gorgeous! This one looks like fun! Thanks, Loretta! A fun tangle! I am originally from San Diego, CA and share the same love of sails as well. We lived in Kent, WA for a couple of years and loved every minute there. Washington is an adventure and a beautiful state. Thank you for sharing! Love this ! So simple but so effective ! !